A free update for all Serious Sam owners, Serious Fusion 2017, is coming. Also: SteamOS/Linux/OSX support, more VR games and The Last Hope “Shanti” update are on the way! New planet, new guns, new enemy type, new features AND a new boss. Shaanti update for SSVR: The Last Hope is coming! Good news everybody! A great PR team could milk this list for an entire month or more, but since our PR team (and in reality it’s just me, the bald middle aged guy writing this. Hi!) never claimed to be any good we’re just going to drop this right here. It’s been an incredibly exciting time for us as we launched our first VR title and our first game in Early Access. We were amazed with the amount of positive comments, great ideas and new features that our fans suggested. We were also amazed by our own stupidity and naivety. We tried to implement, well, almost all of those ideas. While co-op was and remains one of the often requested features, the truth is that a fairly small percentage of players actually plays in co-op. But we said we’d listen, so we rushed to implement this feature and were very proud that we actually pulled it off. Serious Sam VR: The Last Hope in co-op requires serious skill and teamwork at harder difficulty settings and the game is even more fun when played with a friend. The thing is, the decision to implement co-op straight away made a joke of our timetable for regular content updates and this left us with more and more fans requesting a status update on the game (we DO have one today). Note to self: stick to the original GDD and ship planned features first, collect Early Access feedback and implement those ideas later. Case in point: one of the most requested features from VR fans was actually moving around the map and exploring. Since The Last Hope movement was on a room-scale level and the whole game is essentially an arcade-like experience and a love letter to old machines, adding full locomotion to the game meant that we’d have to start from scratch, ditch or re-make most of the levels and basically abandon the original idea altogether. Instead, we started experimenting with VR and prototyping movement in The First Encounter and made surprisingly good progress. So good, in fact, that we felt confident that the game was *almost* ready for VR. The decision was made to bring this game to Early Access as well. The good: we couldn’t have possibly predicted all of the preferred ways of locomotion, but once more we got amazing feedback and added even more ways to move around the virtual world. And comments like this kept us moving. The bad: We now have two games in Early Access, both set in Serious Sam universe, which seems to create some confusion among fans and it’s our fault. To make things right and to make it perfectly clear that those are two very different games, we came up with a brilliant plan (if we do say so ourselves): we’ll just add two or three more games into the VR mix! That way there can be no doubt: we remain committed to VR and having fun with this amazing new tech! Of course, we’ll first ship updates and work faster to complete the existing games in Early Access. Our VR teams were recently expanded and today we’re announcing a tech update that will enable us to easily ship updated code more regularly! Finally, it’s been a really long time since somebody asked about Serious Sam 4 in the comments section, but we’ll go ahead and say it anyway: yes, it’s still happening. 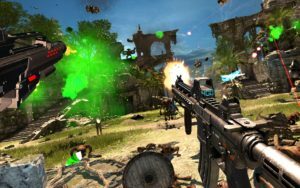 Serious Sam VR: The Last Hope “Shaanti” update is now finished and will become available right after internal testing. The update will include the new planet (Shaanti), new weapons (one melee and one long ranged weapon), new feature (Sam’s personal shield) and a very scary new boss. Boo! Yes, there will be SSVR: The Second Encounter and Serious Sam 3 VR: BFE! Yes, there will be The Talos Principle VR! 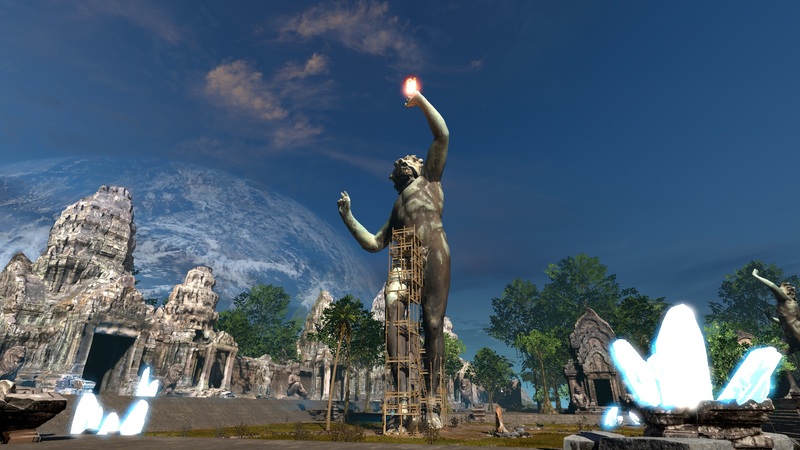 Yes, Serious Sam 4 is still happening and our core team remains hard at work on this, while two much smaller VR teams will continue to grow and work on more VR projects. No, we haven’t forgotten our “flat” games. We’re announcing Serious Sam Fusion 2017, a FREE update for all owners of Serious Sam games, both flat and VR versions. This update will be rolled out gradually, starting with The First Encounter, and then The Second Encounter and Serious Sam 3: BFE. Serious Sam Fusion 2017 update will bring a common workshop for cross-game mods support, as well as enable multiplayer between “flat” and VR versions of games, among other things. So, if you have Serious Sam VR: The First Encounter and your friend has The First Encounter HD, you can connect and play coop or versus with one another – using Fusion 2017. And last but not the least – we will now be able to more easily ship updated code towards all these titles more regularly!